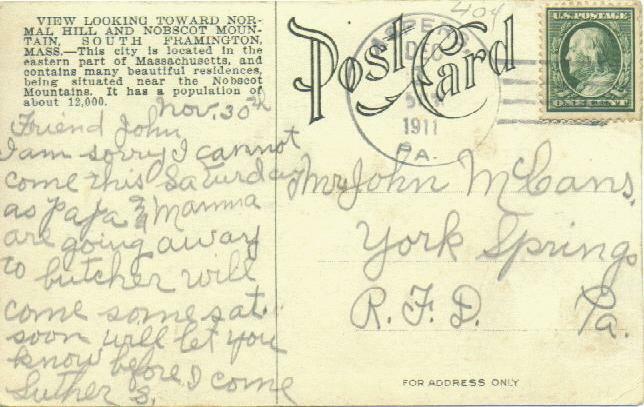 Special thanks to Harvey Chafitz for allowing us to present his personal collection of Framingham post cards. Harvey has collected the post cards over the past 25 years as he and his wife Pepi raised their two children; son James, a 1983 FSH graduate, and daughter Jen, a 1989 FSH graduate. 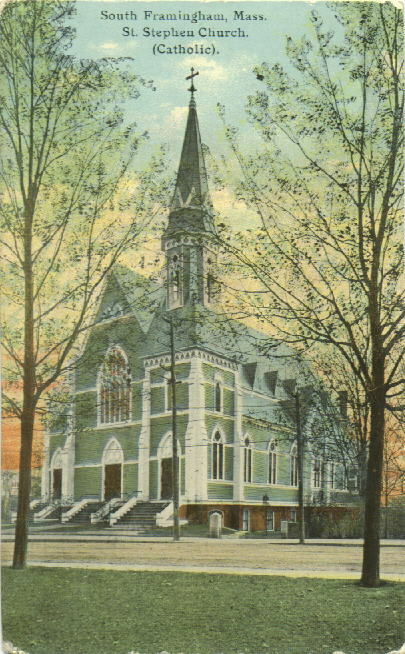 Harvey and Pepi both served as Town Meeting Members, (Pepi 1982-91, Harvey 1983-91), and, among other issues, were both active in "Save Our Neighborhood" an organization which opposed zoning changes for Macomber Estate that could have led to dense development and heavy traffic in the historic Salem End area of town. Perhaps you'll find a handwritten message from a relative or ancestor, or get an idea of how your neighborhood looked 100 years ago, or maybe you'll just relax and enjoy spending a little time looking through this internet window on the past. 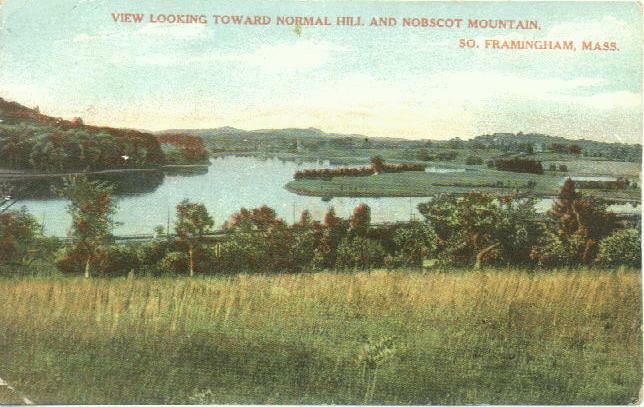 There are many other views of Framingham's lakes, mountains, and other natural subjects pictured as they were at the turn of the 20th century. 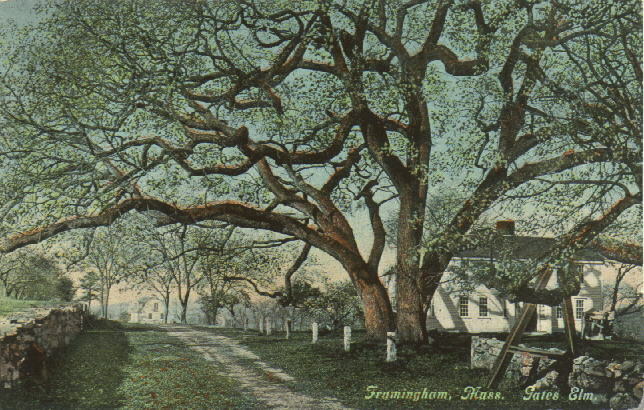 The next card (shown below) is titled "Framingham Mass., Gates Elm". It shows a view behind the former Timothy's Spirits building, near the recently developed 9/90 project (intersection of Worcester Road and Massachusetts Turnpike at exit 12). 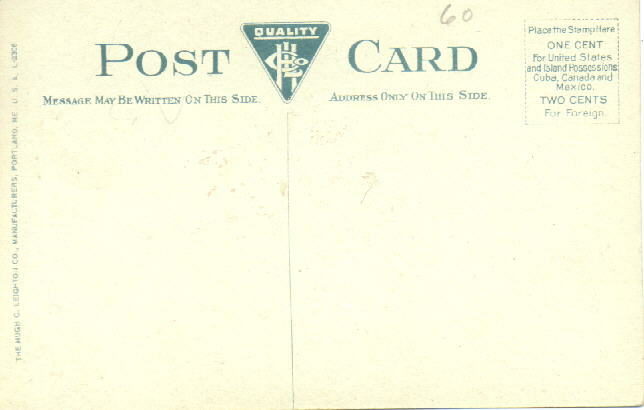 NOTE: Thoughout these pages you may click on the small post card images to display a full-screen view of the card. 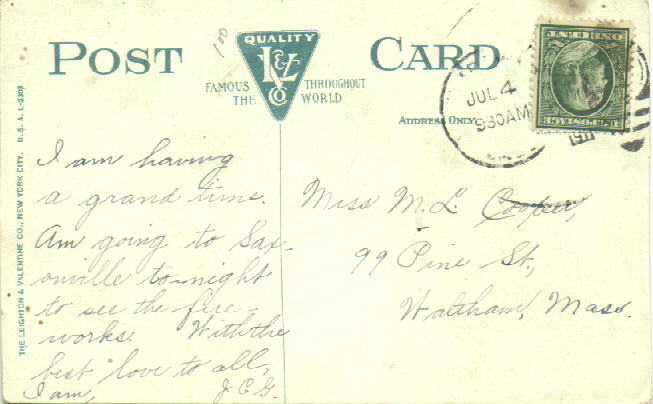 Although only some of the postcards bear handwriting, addresses, postage, and post marks, we have scanned the backs of all cards since some of the cards were published with interesting text and graphics on the reverse side..
Next is a view of Saxonville Square. Historic restoration of the buildings around the square was done in the 1980's, and, aside from the dirt roads and trees, the intersection looks pretty much the same today. 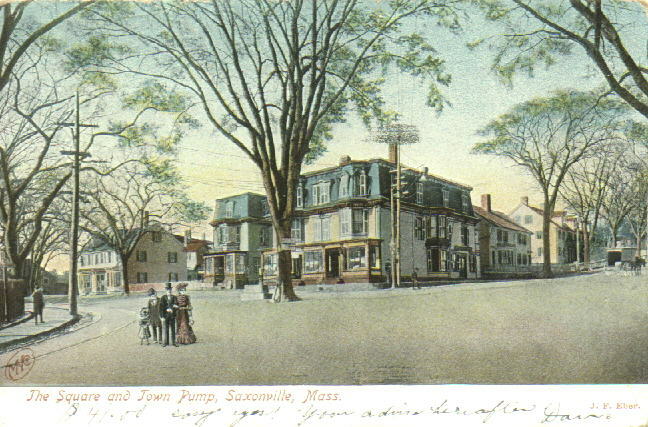 The card is titled "The Square and Town Pump, Saxonville, Mass. - J. F. Eber." and was published as No. 7752 by the The Metropolitan News Co., Boston, Mass, and Germany. Many of the cards were published by J.F. Eber Co., Framingham, Mass. Research by Framingham Town Historian Stephen W. Herring found Jacob F. Eber listed in the Framingham business directories for 1898, 1900, 1906, and 1911 as a stationer. An ad in the 1911 directory says "J.F. Eber - Bookseller and Stationer", and all listings showed the Eber Co. being located in the Nobscot Block. 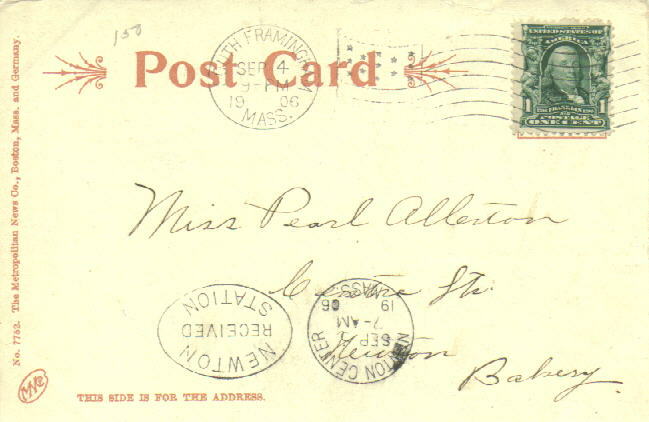 It appears that although Eber published the cards, or sponsored their publication, he was probably not the photographer, (there were only two professional photographers in Framingham at that time; Cokell and Phipps).